When I was teaching my teenage cooking class at the Coop this month, several of my students asked for a list of hand tools that they NEED to have in their kitchen. One of the dishes we made at class. The requests got me to thinking. Everything should have a couple of jobs, not just one. They should be durable, healthy-no toxic no-stick for me, and preferably made in the USA. So how lean can I get and still be able to turn out the meals and baking I love? I'm going to assume that everyone has a wonderful pot and pan set to begin the setup. Cutco knives are made in the USA and come with a lifetime guarantee. Even better, they let you send the knives off to Olean NY and send them back SHARPENED! for life. You have to have a good cutting board. These are big enough to chop everything for stirfry. Love the colors and have 3 so one can be vegetables, one meat and the 3rd is my baking board. These are restaurant quality and durability. Bench knives are used to move food into pans, clean up counters, cut doughs. I use mine daily. You have to have a grater to make macoroni & cheese or zucchini bread. This one has 4 different grating sides and folds flat for storage. But using a huge grater for just a bit of lemon peel is overkill. This flat Microplane works perfectly and comes with a plastic cover for safe storage. This is the professional version with metal sides. Now that we have saved a bit of space, let's use it all up with these colanders. I know, they are a bit big, but you can't steam Thai Sticky Rice in a silicone colander. I store room temperature produce on the counter in the unused ones. Stainless steel bowls are essential for all cooking, this nested set gives lots of options. Got to have a way to grab things from the oven or stove. 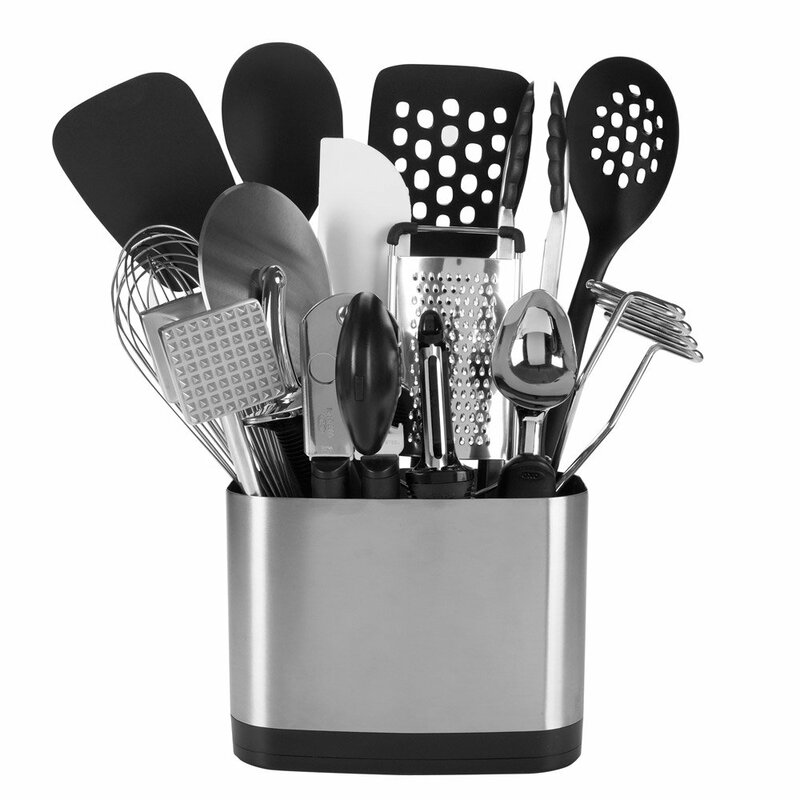 Ok, so this one is a bit of a cheat, gathering the spoons, spatula, pizza cutter, whisk, can opener, tongs and turner into one convenient holder, but it is so cute for the counter. And it is OXO so you know the quality is there. This is my list of the ten hand tools I couldn't live without. What's on your list of tools?